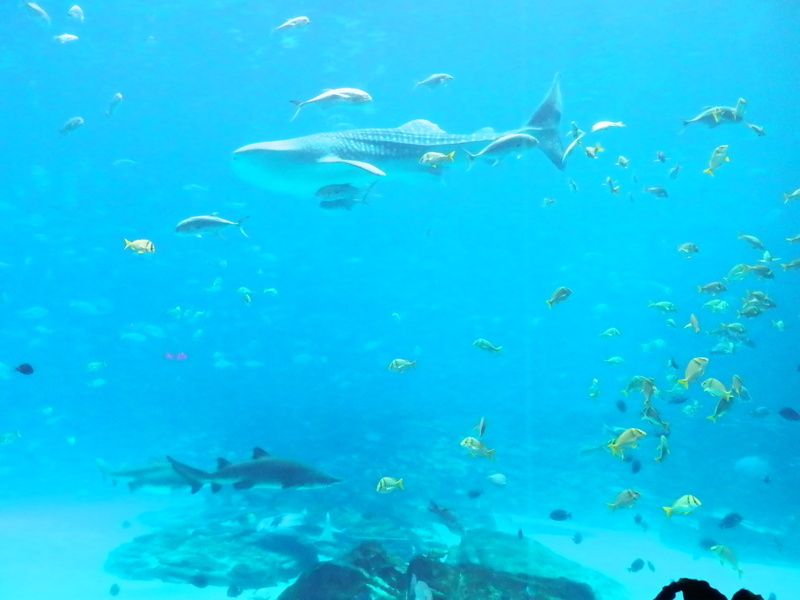 Georgia Aquarium’s Ocean Voyager exhibit, at 6.3 million gallons is the largest aquarium habitat in the world, is the best marine exhibit I’ve ever seen. With over 4,500 square feet and 185 tons of acrylic viewing windows wherever you are in this exhibit you have a fish eye view on a plethora of marine life. The Ocean Voyager exhibit is home to a variety of rays and sharks, exotic fish like the humphead wrasse who reminded me of a 90’s Prince look-alike, and some species I’d never heard of before like the wobbegong which is the common name given to 12 species of carpet sharks, two of which are found here, the spotted and the tasselled which looks like a marine version of a 60’s shag rug. Walking through the exhibit I was overwhelmed with the chance to be face to face with some of the ocean’s most amazing creatures, whether you’re looking straight on, up into it, climbing into a porthole to be immersed in it or standing in front of the world’s second largest viewing window, at 23′ tall, 61′ wide and 2′ think, you’ll be slack-jawed with eyes wide looking at a slice of the majesty of the ocean. Another fantastic view is from the 100′ long underwater tunnel, where you can walk through, or pause off to the side or sit and take in the wonders that surround you. It is here I spent the most time, peeking in the dark corners where the giant grouper that can reach 7′ and 250lbs lurk, and craning my neck as the majestic whale sharks swam overhead. I must admit I’ve been slightly obsessed with these beautiful creatures since first I heard of them, but nothing can prepare you for when you first lay eyes on them. Whale sharks aren’t really whales at all, they’re sharks and able to reach lengths of over 40′, they are the largest fish which is mind-blowing especially when you realize that the four at the Georgia Aquarium are only juveniles, so are still growing. 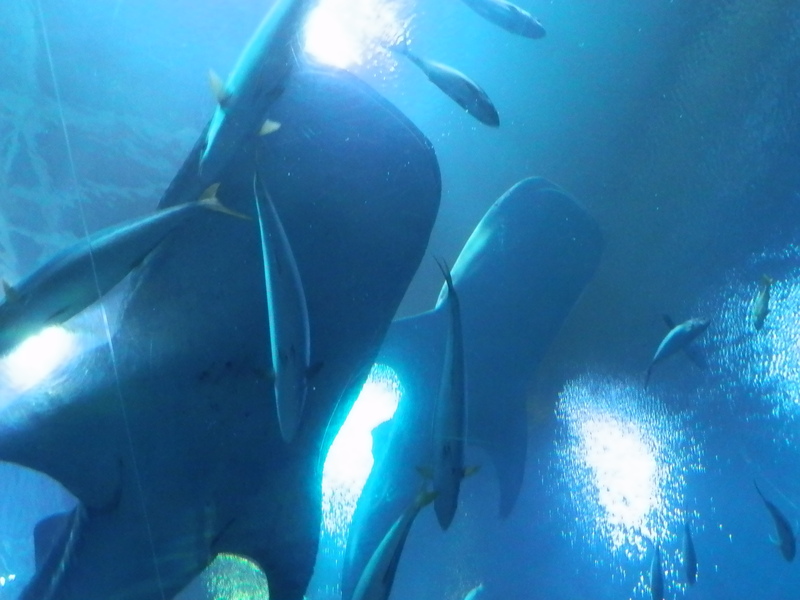 The aquarium offers an awesome opportunity for visitors to be witness to a live feeding of these gentle giants. At the large viewing window there is stadium seating and I highly recommend you take a seat to watch and learn as one of the volunteers takes you through the process as right before your eyes these massive creatures open their massive 4′ wide mouths to feed on plankton, small fish and squid. You can see them from below through the viewing window as they feed or on the big screen in the corner that shows a bird’s-eye view. 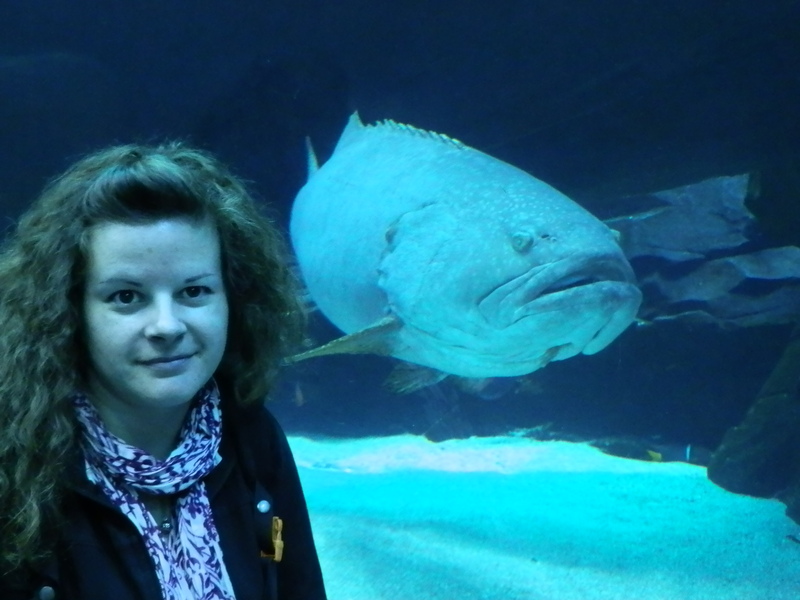 It’s quite astounding to think these large fish can survive on the smallest of fish. As you can imagine it was no small feat getting four whale sharks to Atlanta, Georgia from Taiwan and you can learn more about the literal massive undertaking it was as well as more on continuing conservation efforts in a gallery within the Ocean Voyager exhibit. One of the many things I learned about these endangered creatures was that the four whale sharks, though were taken from the wild, were taken from Taiwan’s annual fishing kill quota, which has now been extinguished, so in essence saved from being eaten. Being the only aquarium outside of Asia to house whale sharks, I can’t begin to express how thankful I am that I had the opportunity to be up close and able to fully appreciate these great gentle giants. Alongside the whale sharks are many other species of sharks like zebra, black tip reef, sand tiger and sandbar sharks as well as many species of rays including the sawfish which looks like a shark but is actually a ray and of course the magnificent manta rays, of which the aquarium now has four. The newest addition is the only male weighing over 250lbs and almost 9′ across. The large viewing window gives amazing views of the manta rays; as I sat and watched two of them swim in circles, it was as if they were graceful ballerinas on stage at a ballet. It left me in awe that such a large creature could move so effortlessly. The architects that built the Georgia Aquarium fashioned its blue metal and glass exterior to resemble a giant ark breaking through a wave and nowhere is the symbolism more present than in the exhibit of the Ocean Voyager. That photo makes it look almost like you are underwater with the fish. Thanks! Are you speaking of the first one? It reminds me of a postcard and to me really captures the feel of this amazing exhibit. 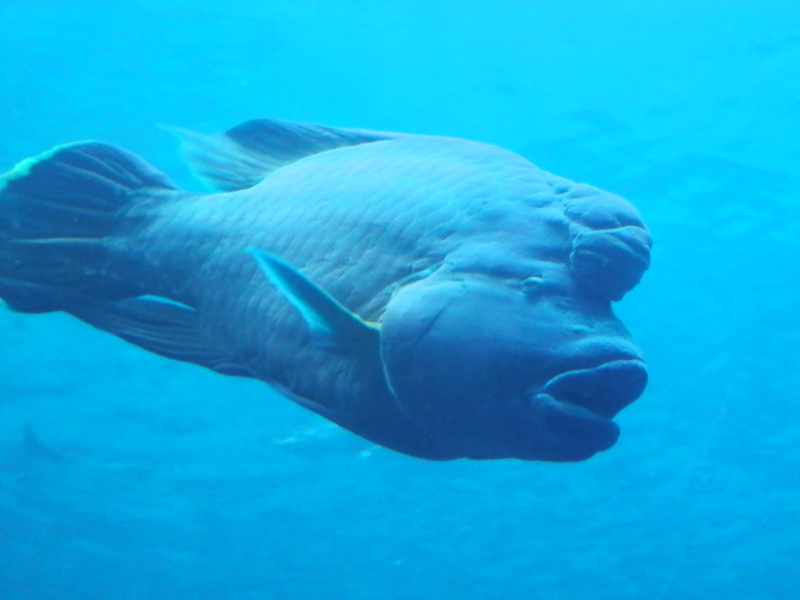 That Humphead Wrasse is a curious looking fish! I also love aquariums. My favourite is the one with the manatees at Seaworld, Florida.